Creates a new Mz3 Book based on a PDF File. If the naming of the PDF file follows best practices and contains a language code at the end (2 lower case letters representing the language followed after an underscore), that language is used as book language. In this example, there is no language code available, so “en” for English is proposed. This code can be overwritten to change and select the correct language for the book. This only is needed in case a multilingual book is planned and the content of the pdf file is in a different language. If all settings are OK you can Continue and the PDF Conversion Window opens automatically and the first conversion can be started. *Hint: Only convert 4…10 pages the first time to verify all conversion settings are OK. A conversion is hard to abort and may take a while for many pages. You might want to adjust quality and page size first. 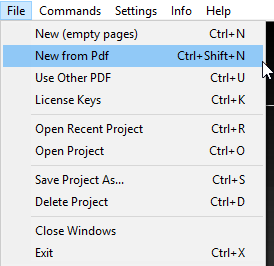 If everything is OK you can open the “PDF Conversion Window:https://doc.megazine3.de/mz3tool.2.4.3.11.doc/en/topic/convert-pdf again and make the next/final conversion.